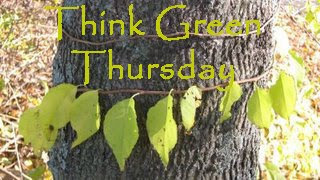 Michelle of Rambling Woods is hosting Thing Green Thursday for the time being. The process of dune formation begins with a steady on-shore wind capable of moving sand. The wind moves the sand into piles. Eventually the sand pile becomes so steep that the leeward side of the sand pile collapses under its own weight and spills down at an angle that serves to stabilize the dune. Over time, the dune migrates in the direction of the wind, as the wind moves sand up the dune's slope and over the edge. 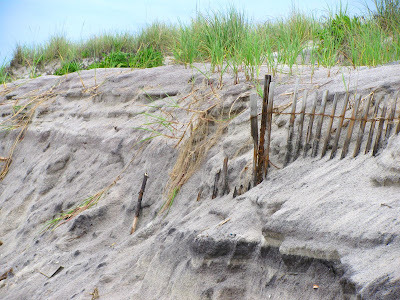 Sand dunes often form around obstructions such as rocks, drift wood, decaying plant matter, and detritus that is washed up during high-tide. This decaying plant matter forms a perfect substrate for plants to set root. Plants that first set root in sand dunes are referred to as pioneer plants and are often grasses that have special adaptations for the harsh environment of the dune (high salt tolerance, waxy leaves that retain water, rolled leaves to reduce surface area and exposure to evaporation). These pioneer plants stabilize the dune. Their roots bind the sand and their leaves decrease wind speed and reduce erosion. After pioneer plants stabilize the dune, it becomes more habitable for other plants to move in. A progression of vegetation types set hold onto the dune, each changing the substrate's characteristics and structure, gradually making the dune suitable for the next vegetation type. Sand dunes, though dynamic, are fragile habitats. The mat of vegetation covering a dune is vital to reducing dune erosion and if this vegetation is disturbed or uprooted, the dune is destroyed. Sand dunes provide habitat for a wide variety of wildlife including shorebirds, invertebrates (crabs, insects, and molluscs), and small mammals. Go on over to Michelle of Rambling Woods to see other participants in this meme. Great post Mary. The dunes are such a fragile ecosystem that need protection. Thanks for that, Mary. I love the dunes. I think I'm going to participate in a while. I didn't know that one could think in green, I wonder in what colors I am thinking ! A wealth of info Mary. I think we see the dunes and the vegetation and think of their beauty; but we don't stop to think if they weren't there. And how many times do we see someone ignore that "Don't Walk on the Dunes Sign?" That was fascinating. It's another reminder that we really can leave nature alone to do its own thing.